COLUMBUS, Ohio – From freezing temperatures and snow flurries to sunny, 80-degree days in a span of a week — if this type of strange weather continues, growers across Ohio want to know, will this have a negative impact on soybean crops? Not really, according to a field crops expert in the College of Food, Agricultural, and Environmental Sciences at The Ohio State University. Laura Lindsey, a soybean and small grains specialist with Ohio State University Extension, says that soybean crop yields tend not to fluctuate much and are less likely to be negatively impacted by less than ideal weather compared to other grain crops such as corn. In fact, the state average soybean yield declined only 8 percent during the drought of 2012, Lindsey said, noting that Ohio’s average soybean yield that year was 45 bushels per acre, compared to the five-year average of 49 bushels per acre. “At this point in the season, it’s really hard to tell what the soybean yields will be this year,” she said. “There are a lot of concerned farmers going into spring planting right now with all of this unusual weather we’ve been experiencing throughout the state. Because soybean vegetative and reproductive stages overlap, that allows the soybean plant to compensate for short periods of stress, Lindsey said. So while many soybean plants were stunted during the height of the 2012 drought, the plants were able to recover and see positive yields thanks to rainfall in August and September that worked to promote seed fill, she said. At this point, she said, the best thing soybean growers can do is to focus on the things they can control, such as following the best management practices for their crops. “Seeding rates and row spacing, planter calibration, and ensuring field conditions are appropriate for planting are important considerations to achieve optimum soybean yields,” Lindsey said. “Spring is also a good time to pull soil samples to test for fertility and soybean cyst nematodes. 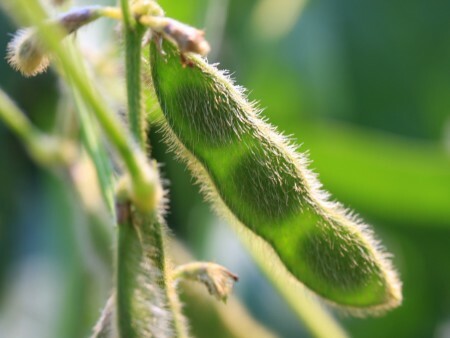 Ohio soybeans planted between May 1 through mid-May resulted in better yields, according to a study by researchers from OSU Extension and the Ohio Agricultural Research and Development Center. OSU Extension and OARDC are the outreach and research arms, respectively, of the college. In the study of 2013 and 2014 planting trials at OARDC’s Western Agricultural Research Station near South Charleston, Ohio, soybean yields decreased by 0.6 bushels per acre per day when planted after mid-May, Lindsey said. Those yield results held true if the soil temperatures were 50 degrees or warmer, she said. However, soybeans planted too early when soil conditions were not adequate resulted in bean leaf beetle defoliation and frost damage. “There are some exceptions to a yield advantage when planting early, such as if the soils aren’t warm enough or if the fields are too wet,” she said. “In those cases, early planting can be detrimental to soybean yields.